Habits are hard to break... why not make them fabulous? Stripes and gold shoes for the win. 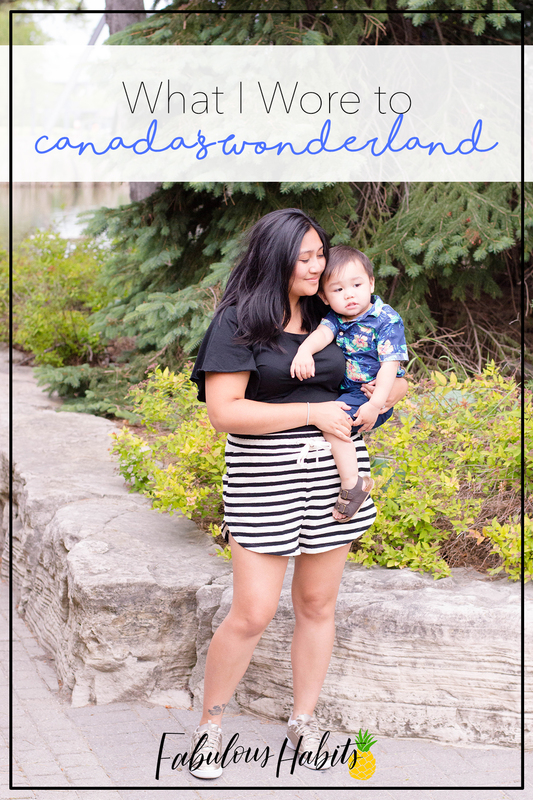 Comfy, easy, and versatile – this is what I wore to Canada’s Wonderland. This post contains affiliate links which means, at no additional cost to you, I earn a commission if you make a purchase from our links. Thank you for supporting Fabulous Habits and being a part of our community! I was extremely excited when Joe and I decided to organize a last-minute trip to Toronto. I used to visit the city often, especially growing up to see family. For a quick weekend getaway, we decided to pack our bags and visit my aunt and then enjoy a full day at Canada’s Wonderland. Dressing up my post-baby body has been a learning experience. Our bodies change so much throughout pregnancy and even more after giving birth. Sure, I’ve had my fair share of tears in changing rooms but now, I’m embracing my new look. I’ve also been making healthy choices for both my physical and emotional well-being. I went for a t-shirt-and-shorts combo for what I wore to Canada’s Wonderland. The look was simple, comfortable, and made me feel good. I like that my t-shirt flaunts flutter-like sleeves, giving it a special touch to an otherwise basic tee. 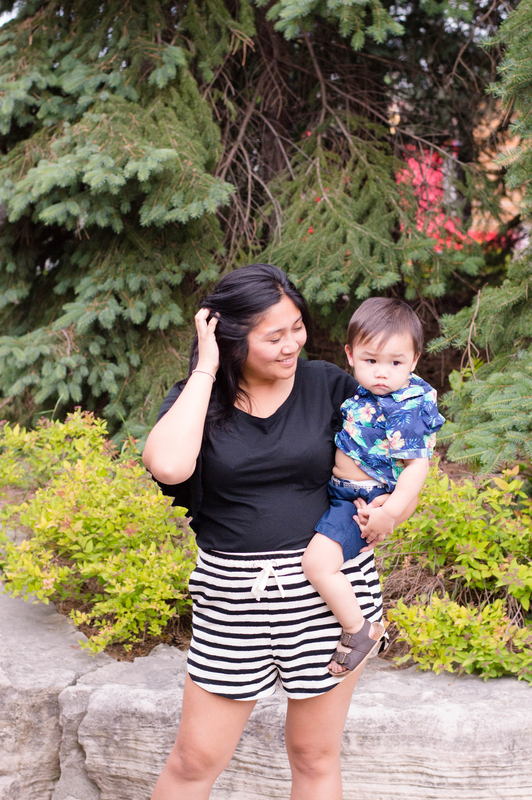 The shorts have an elastic-waist, making it easy on my c-section belly. The striped detail making them more fun and unique than say, a pair of denim cutoffs. My favourite part to this outfit, I must say, are my golden sneakers. I got them for Christmas last year and haven’t found much opportunity to sport them. I decided to channel my 13-year-old self and thought: “As a preteen, what footwear would have I chosen to visit an amusement park?” Sneakers. Plain and simple. A pair of sneakers is perfect for a long day of walking… so why not make them golden? How do you dress your post-baby body? Did you see any big changes after giving birth? Those shoes are so cute. I love the color, too! I am ALWAYS looking for comfy shoes. I love the entire outfit and those sneakers are so pretty and practical. I love the flutter sleeves on the t-shirt – what a cute outfit! I love your outfit and it looks so cute and comfy but what caught my attention the most was the Tennis Shoes and as soon as my son saw them he let me know I needed a pair and if he could find me in gold he wanted a pair as well and we could be twins. I love your sneakers! They’re so versatile! And I need those shorts! Fun outfit and crazy awesome shoes. I love the hemline of the shorts, super cute and very flattering! Now that looks comfortable and it is dressy also. I am off for dressing up if I can wear something comfortable LOL. I love that outfit. It looks so comfortable and looks great on. It’s tough to find cute things after baby, but you nailed it. It’s the perfect summer outfit especially if you’re going out and about! I love the combination of the stripes and the black top plus that super cute sneakers! Having a good pair of shoes to walk around and enjoy your day is extremely important. Extra nice when they are cute as well. You look great in this outfit! It looks nice and comfy. I am really loving your shoes too! Those are really cute shorts. They look nice and comfortable and easy to maneuver in. Which is perfect when handling a toddler. I LOVE those shorts! Not only do they look super cute and stylish but they also look comfy!! Not yet a mom here but I think I love that striped shorts and gold shoes too. Perfect for outfit for some outdoor walkathon trip. The perfect theme park outfit! I am near another theme park and I think I need to get those shorts before the next time I visit. I wore jeans last time and it was just too hot! Love the shorts, it looks very comfortable. Hubby and I are planning to visit Canada for our anniversary. What a cute outfit looks great on you and very comfy. My kind of clothing when I am out for adventure I miss Canada. Its been year since we were there time to make plans. I love comfy and relaxing clothes that get me through the summer heat while I go about my day! I think these are so pretty and perfect for the season! I just love your style! I love those sneakers! And for me, no clingy and flowy tops have been my go-to since having kids. Such a cute look. Love the shorts. I am a big fan of comfort and chic looks. Love the stripes and the shoes too! You’re so fashionable!!! love it! Ohh I love the outfit and you look awesome, momma! 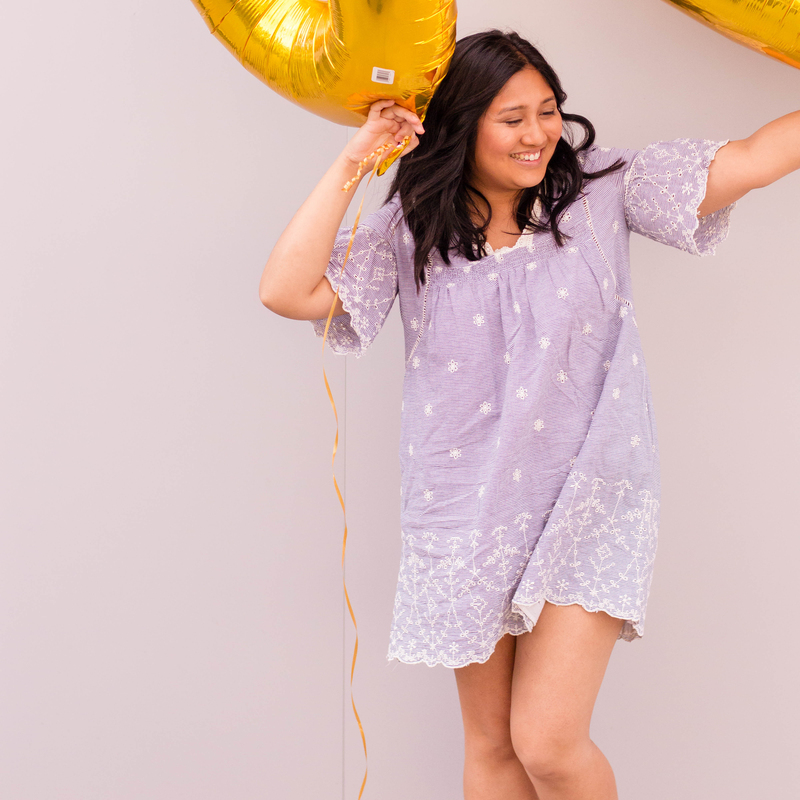 I’m 37 weeks pregnant with my first baby right now, but know that once I’m in post-baby time I’ll be living in elastic waistband shorts and flowy dresses. They are just SO forgiving haha! ADORABLE outfit! Love the shoes! My name is Lisa: mommy, wifey, and dessert enthusiast. Welcome to Fabulous Habits, where I'll be highlighting the best in food, fashion, beauty, and parenting. Habits are hard to break, so why not make them fab? Our bi-weekly newsletter showcases our newest posts, our latest stories, and the things we love.